Introducing the exclusive BarCooler Bundle! This premium quality, patent pending BarCooler Wine Bottle Holder is lined with high quality BPA free Neoprene on the inside. A Wine Tasting E-Book.This 36 page E-Book gives you everything you need to choose your wine. Most wine bottle brands fit the BarCooler Wine Bottle Insulator. 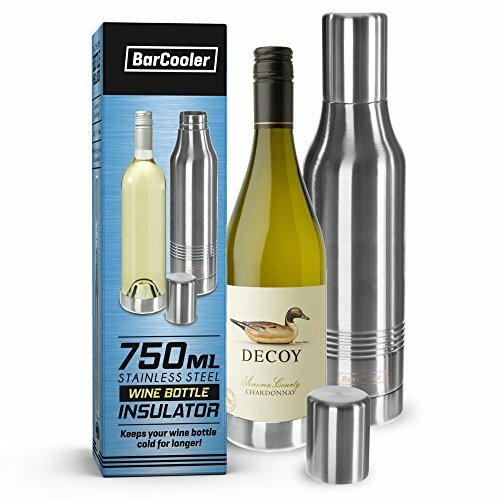 Click "ADD TO CART" and get the BarCooler Wine Bottle Insulator special Amazon bundle TODAY!  STAINLESS STEEL WINE BOTTLE COOLER KEEPS YOUR WINE BOTTLES ICY COLD ! 18/8 Stainless Steel Double Wall holder keeps your wine bottle icy cold for longer. It's the ultimate wine bottle cooler ! A GREAT GIFT - the perfect gift for Birthdays, Fathers Day, Christmas, Thanksgiving or Groomsmen's Gifts. Also for the outdoors, by the pool, camping, tailgating, hunting, boating, hiking, BBQ, travelling, baseball, NFL, soccer, mountain biking, parties and RV camping. Have them personalized by laser engraving, silk-screening or adding a NFL Football decal. Enjoy your favorite wine with the durable BarCooler Wine Bottle Insulator.  FITS MOST WINE BOTTLES ! Including popular brands such as Gallo, Lindemans, Hardy's, Yellow Tail, Sutter Home and Blossom Hill and many more !  SPECIAL AMAZON BUNDLE INCLUDES - One Premium Quality 18/8 Stainless Steel Double Wall BarCooler Wine Bottle Cooler + Wine Tasting E-Book + One Beautiful Gift Box ! Plus, our BarCooler Wine Bottle Insulator is 100% BPA Free. Non-Toxic. Patent Pending Design.  100% SATISFACTION OR YOUR MONEY BACK - Order now and put us to the test. If you have any questions about this product by BarCooler, contact us by completing and submitting the form below. If you are looking for a specif part number, please include it with your message.